The latest figures, says the WTO, are “a disappointing development and underline a recent weakening in the relationship between trade and GDP growth”. 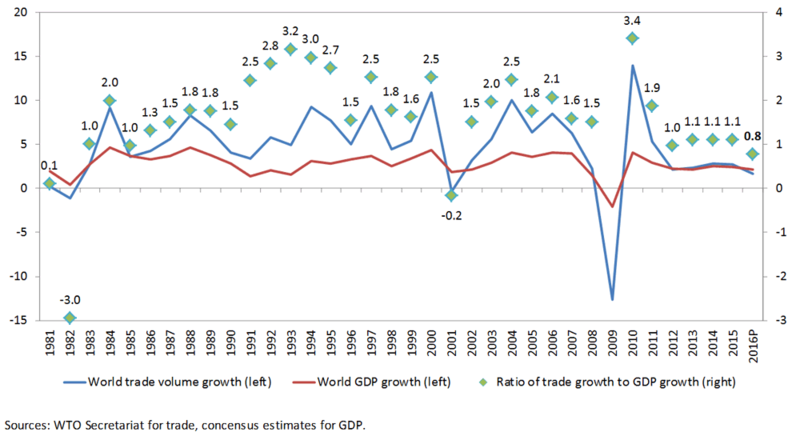 While trade has typically grown in recent decades at 1.5 times faster than GDP, the ratio has in recent years slipped towards 1:1. Here is the WTO’s chart that tracks GDP and trade volumes over the last 35 years – since near the start of the globalisation era. 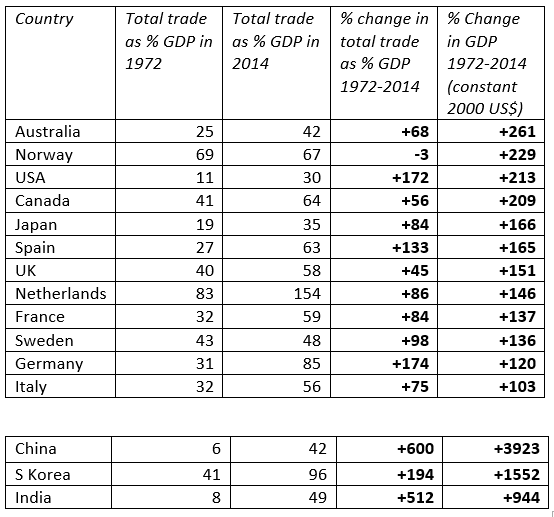 But the relationship between trade and GDP for individual countries is far less clear. I have looked at a set of 15 countries – 12 so-called “advanced economies”, and 3 “emerging economies”, over the period 1972 to 2014 (1972 being the year the UK joined what became the EU, and also the effective start of the North Sea oil and gas era). In the Table below, I have calculated the increases in GDP, and placed the countries in sequence according to their percentage increase. Alongside this, I have taken the figures for total trade as a percentage of GDP for the years 1972 and 2014, and calculated the percentage change between the years. Of course, this second calculation is not to compare directly with the GDP increase, as it is not the volume that is measured, but the share of trade in the economy. That said, it shows (a) that trade has increased as a share of the economy in every country looked at except Norway, but (b) the extent of change in this share differs enormously between countries – and is not correlated in any evident way with the rate of increase in GDP. To take one example, trade as a share of the economy in Italy is almost identical to that in the UK (and France) – yet Italy’s GDP has increased by far less than the UK’s over the 42 years. It is interesting to see that - after Norway - the UK shows the smallest increase in trade's share in the economy of all the countries looked at. Moreover, among emerging economies the share of trade in the economy may vary rapidly - in 2014, China's share was 42%, as we see - yet it had reached a peak in 2006 of 65%. China's GDP has continued to increase rapidly, yet trade as a share has reduced by one third as it focuses more on the domestic economy. Though its scale of reduction is less, we may note that India's peak year for trade as a share in the economy was 2012, when it reached 56%, compared to 49% in 2014. We may conclude that - without in any way resorting to protectionism - it is possible or desirable for countries (unless very small, perhaps) to rely on trade to a lesser degree when that suits their developmental needs.